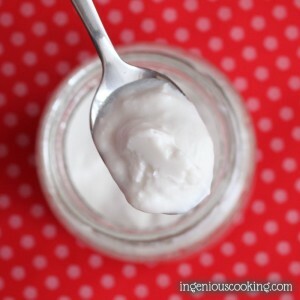 Your very own home-made coconut yogurt! Mix coconut milk/cream and sweetener and heat until almost boiling. Prep thickener: dissolve agar powder in hot, gelatine in cold water. Pour thickener and probiotic powder of the two capsules into coconut milk, mix well. Transfer yogurt-to-be into glass jars and store in a warm place for 8, 16 or 24 hours - the longer the time, the tangier the yogurt. The ideal climate for this is around 50 C / 115 F - I used the thawing function of my oven. Taste check every couple of hours to see how your yogurt is doing. It's going to be sweet in the beginning due to honey and get more and more tangy over time. Once you think you're done, put your yogurt for at least 6 hours in the fridge for the fermentation process to stop and the thickener to work. When using canned coconut milk, that would separate in the can, it will separate as yogurt, too. Before placing it in the fridge take a very, very clean spoon, stir it well and put your yogurt in the freezer for approx. 30 minutes. This way the thickener will set more quickly and keep the yogurt from separating. I tried coconut milk and cream, too: the yogurt made from coconut milk had the consistency of a yogurt to drink or kefir, the one made from coconut cream turned out much thicker and scoopable, like Greek yogurt, but it also had a lot stronger coconut flavor.